Exciting news – the long awaited Brambleton Library will open its doors to the public tomorrow! The Brambleton Library will host a ribbon cutting and grand opening celebration on Saturday, December 1st at 1 PM. Come explore this state-of-the-art facility and discover new resources for Brambleton residents.Thousands are expected to attend the opening and in addition to speakers and the ribbon cutting ceremony, the Brambleton Middle School band has a performance planned at 12:30pm and a few special story book characters will be in attendance to mingle with patrons. Take a look below at the sneak peek Loudoun Now compiled after visiting the space during the media day earlier this week. We are so excited that the entire Loudoun County community will be able to share this one-of-a-kind space with Brambleton. We hope to everyone this weekend to help celebrate this new chapter for the Loudoun County Public Library system here at Brambleton Town Center. At 1 p.m. Saturday, Brambleton Library will open its doors to the public and already it’s expected to be the busiest library in Loudoun County. When the library staff recently sent out a mass email announcing the library’s opening date, 50,000 people clicked on the link to learn more—by far the most traffic the library’s website has ever seen, according to Pete O’Brien, division manager with the library system. As an example, he said story times at Ashburn Library, currently the system’s busiest branch, can draw 100 kids. The story time room at the Brambleton Library is designed to fit close to 200 and will offer 15 story times each week, with some for babies, toddlers, older children, and adults. “We’re planning for big numbers and judging by the response we’ve gotten ahead of the opening, I think we’ll get them,” O’Brien said. The 40,000-square-foot building sits in the heart of Brambleton Town Center and serves as another anchor in the center, only second to the Regal Fox Stadium. 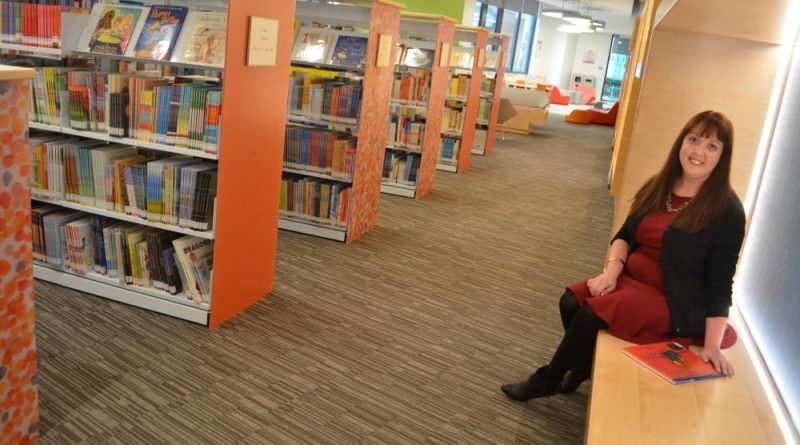 Its designed with a variety of users in mind and features dedicated areas for children, tweens, teens and adults—whether they need a quiet place to work or meeting their book club. 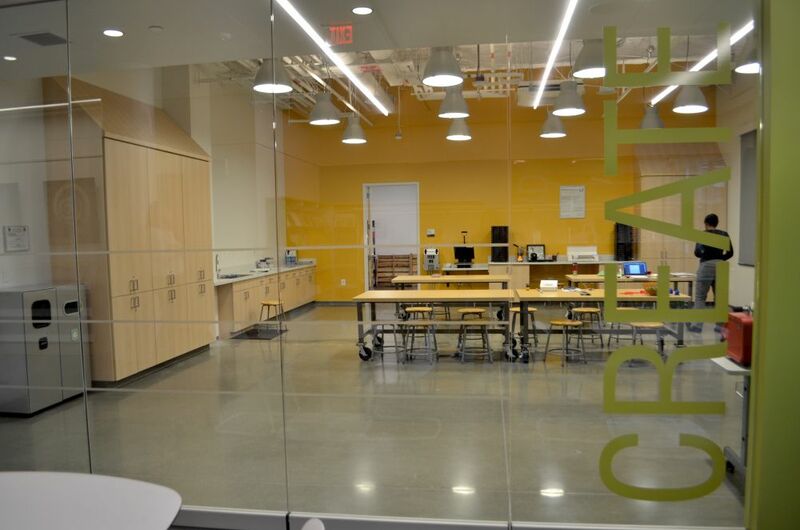 It also has three large meeting rooms; a makerspace with 3D printers, sewing equipment and a recording studio; 10 study rooms and a gaming room in the teen center that overlooks the town center’s courtyard. Christine Thompson moved from Charles County, MD, where she served as a library branch manager, to take the job of Brambleton Library’s branch manager. “I couldn’t pass this up,” she said, standing amid rows of children’s books. Almost the entire first floor is dedicated to children, with picture books, an educational gaming center, and plenty of comfy, bright-colored furniture where little readers can sit and enjoy books. The children’s area also includes Virginia’s first public Tamil-language collection; Tamil is spoken in southern India. The library boasts several other firsts, including a computer that sorts books into categories as they are returned and a sorting room with floor-to-ceiling windows so guests can watch the process. It also features a grassy, fenced-in area where kids can stretch their legs, dozens of quiet spots where people can study or work, and outdoor tables where people can read or work while accessing the library’s free WiFi. Katie Wais, the library system’s public information specialist said of those who want to get work done out of their home, “It’s like a Starbucks alternative.” Plus, patrons are welcome to bring in food and drink from any of the nearby shops. This is the county’s tenth public library and, as each new library is designed and opened, Loudoun County Public Library Director Chang Liu works with designers and builders to make tweaks that accommodate some of the public’s favorite aspects of its existing libraries. The Brambleton Library boasts some of the library system’s most state-of-the-art equipment, modern architectural design and furniture, including an oversized staircase that also serves as an amphitheater. 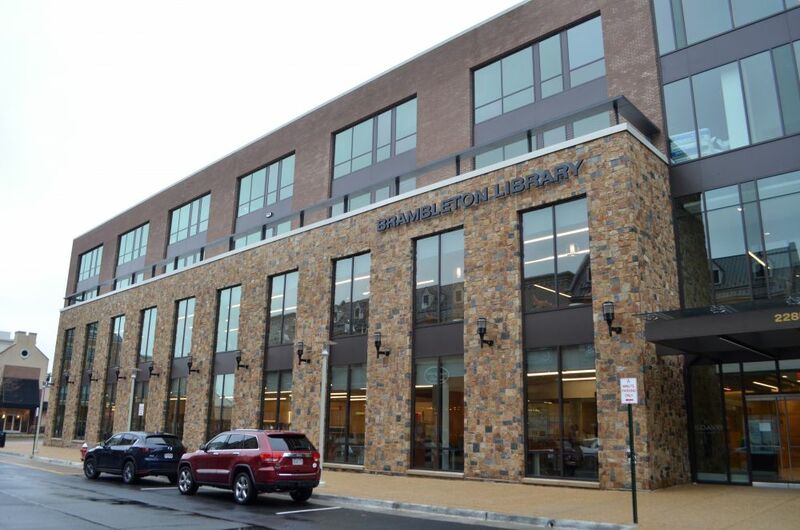 The construction of the Brambleton Library was made possible through a lease-purchase agreement between the county and the Brambleton Group, a real estate development firm. All library programs are free and open to the public. Find the library at 22850 Brambleton Plaza in Brambleton. After a ribbon-cutting ceremony at 1 p.m. Saturday, its regular hours will be 1-5 p.m. Sunday and 10 a.m.-9 p.m. Monday through Saturday. Learn more at library.loudoun.gov.